It’s August already! Summer will be upon us soon, though let’s be honest, we are not totally ready to say goodbye to the warm and comfy food that we love so much in winter! The beauty of Hart & Soul soups is that you can use them as a base to cook your very own recipe. 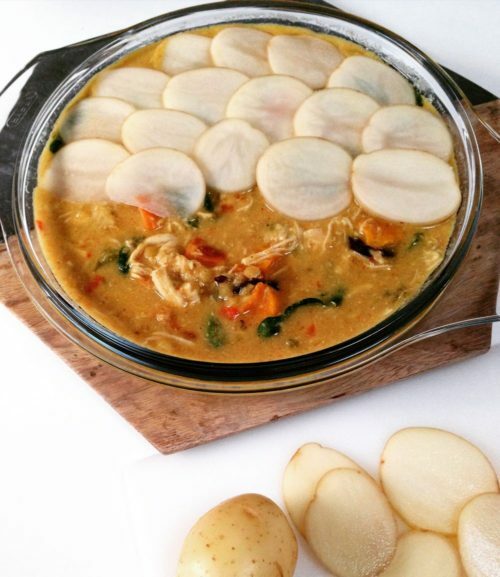 The lovely Alison from @foodlifemumwife, created this sumptuous Potato-topped chicken and vegetable pie using our Coconut & Lentil soup as the base. The bright side of this dish is that you can add any cooked veggies that you happen to have in the fridge! And if you have any leftovers (we bet you won’t), it’s absolutely delicious served with a side of brown rice. Heat the Hart & Soul Coconut & Lentil soup in saucepan on stove top according to instructions on the packaging. Once heated through add the sweet potato, pumpkin, baby spinach leaves and chicken. Pour mixture carefully into a small pie dish. Finely slice the baby new potatoes (no need to peel them, just give them a good wash before) and arrange them carefully on top of the mix so that each one is slightly overlapping the next – a bit like fish scales! Drizzle potatoes with olive oil and season with salt and pepper. Bake in oven for 30-40 mins – cooking time may vary depending on how thinly the potatoes are sliced. Serve with a side of your favourite vegetables or on its own!